Urocare® is the sole manufacturer of reusable latex leg bags, disposable vinyl leg bags and urinary drainage systems that incorporate the full advantages of our famous, patented high-flow anti-reflux valve (#6001). 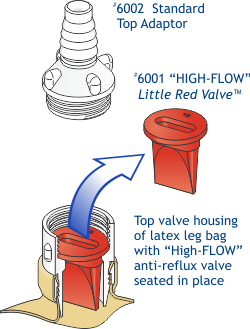 This remarkable anti-reflux valve is enclosed in a hard plastic housing which prevents the valve from being accidentally held closed when in sitting or reclining positions. The valve is virtually self-cleaning and interference free ensuring fast, uninterrupted flow and problem-free use. Don't settle for urine reflux or back- pressure caused by inferior flutter valves. 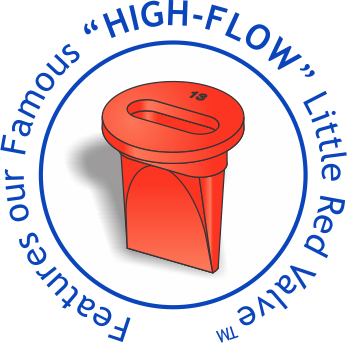 Nothing beats Urocare's new high-flow Little Red Valve for performance, reliability and safety. We don't give odor a chance! We added a special new odor control barrier to the inside and outside of our latex leg bags for double odor protection. Now you can be assured that odor is a thing of the past. This special odor barrier makes Urocare's leg bags virtually ODOR-FREE, not just odor-resistant; thereby preventing embarrassing odors before they start. The Standard Top Adapter (#6002) has a cone-shaped top with reverse grip which aids in the connection of rubber or vinyl tubing while providing a safe & secure connection. Removing the top adapter from the top valve housing exposes our famous Little Red Valve™—see above. A closer look reveals a large opening for quick, easy inspection and cleaning. An improved strap loop design ensures a firm hold and accurate placement. These strap loops are an integral part of the bag, we use no glues or other adhesives which at a later time might allow the loops to separate from the bag. They can't be pulled off without damage to the bag. A durable, seamless, latex body combined with an obstruction-free anti-reflux valve makes Urocare® latex leg bags the preferred choice for security and quality. Our Standard Bottom Drain Valve (#6004) is a unique, twist-type valve with a gasket ring that seals the threads of the bottom valve housing and prevents urine from touching the fingers while draining. If desired, pliable, white-rubber tubing may be attached to the lower half of the valve; in addition, there are optional attachments that may be purchased separately and substituted in its place. For additional information on these attachments see Quick-Drain™ Valves, Straight-Thru Adaptor with Thumb Clamp or Replacement Adaptors and Drain Valves. For replacement parts click here. IMPORTANT! Rinsing alone does not clean a urinary appliance. Proper care and maintenance is crucial to getting the maximum life out of your latex leg bag. Using the proper cleanser will help ensure the bag is working at it's maximum potential. Use Urolux® urinary appliance cleanser & deodorant (#700216). Do not use boiling water, vinegar, bleaches or toilet bowl cleaners; these chemicals will damage or distort plastic and latex parts. 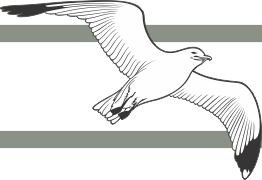 * Sport Bags are worn horizontally across the leg beneath shorts, skirts and swimsuits.